You may love the cheery glow of that incandescent bulb but the bottom line of your household budget may not have that luxury. LEDs are a money-saving answer to a costly energy question. To help you get the most out of your LEDs, we are defining what measurement really determines light output. It’s time to clear up some common misconceptions about the relationship between Watts and Lumens. FACT #1: There is no direct conversion from Watts to Lumens. That’s right. Watts and Lumens have no direct relationship. Most likely because Watts are units of power used but Lumens are units of light emitted. Sure, higher wattage bulbs give off more Lumens, but two LED bulbs with the same wattage can give off different amounts of Lumens depending on how efficient the bulb is. While you may know your treasured incandescent bulb uses 60 Watts of power, do you how many Lumens the bulb emits? Generally, a 60-Watt incandescent bulb emits an average of 800 Lumens. This is where wattage equivalency comes into play. Many consumers buy LEDs based on the assigned wattage equivalency, but LEDs use far less wattage than their CFL, halogen, and especially their incandescent counterparts. So how do manufacturers assign wattage equivalency? It’s more of an educated guess. Based on the LED’s Lumen output, you can assume its equivalent is about the same wattage as an incandescent with a similar output. FACT #2: Lumens represent how much total light (i.e. brightness) is emitted from a light source. In the good ol’ days, a light bulb’s wattage was more important, given that a circuit can only handle a certain amount of power drawn, limiting the number of electrical devices per circuit. Wattage is still important, but the rise of LEDs with their drastically lower power consumption, it’s becoming a less important factor. Now it’s more significant to have the right amount of light, making the number of Lumens a better gauge of what to buy. FACT #3: You can use an LED with a higher wattage equivalency in a fixture with a lower incandescent wattage rating. You can use a 100 Watt equal LED in a 60 Watt fixture. Let me explain. Let’s say your LED is approximately as bright as a 60-Watt incandescent but only uses about 9 Watts of power. Your fixture, let’s use a single socket floor lamp, is rated to handle a maximum power draw of 60 Watts. Even though the LED is a 60-Watt equal, it’s only drawing 9 Watts, meaning you aren’t even close to using the maximum capacity of the fixture. That surplus allows you to choose an LED with more Lumens, meaning a higher wattage equivalency. But why would you want a brighter bulb? In the case of the floor lamp or even an overhead fixture, a brighter bulb translates to more Lumens per square foot. With more Lumens per square foot in your room, you may not need that extra table lamp in the corner. Now that doesn’t mean go out and buy a 1000-Watt equal LED to light your living room like an x-ray. It just means a 75-Watt or 100-Watt equal LED could reduce the number of light sources needed in each room. Eliminating extra fixtures means less power used and more money in your wallet. 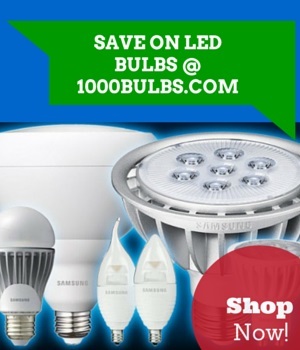 Do you have advice on how to save even more on your electricity bill, or are you looking for that perfect LED? Leave your comment or question in the area below. Find more tips, ideas, and information about lighting on our Facebook, Twitter, Google Plus, LinkedIn, or Pinterest. The 1000Bulbs.com staff wants you to live smarter, not harder, so call us at 1-800-624-4488 for your next everyday lighting solution.